How to Tell if You Are in a High Fantasy Novel – Another guide from The Toast. Dapper Monsters – I like the bow tie on the shoggoth. Zeppelin! – These kids doing xylophone covers of Led Zeppelin songs are jaw-droppingly talented. Home – This lovely embroidered sentiment with NSFW language made me giggle. Put a Tentacle On It – Offbeat Home has some attractive octopode decor suggestions. Monsters in America – Attractive cryptozoological map of the U.S., showing the home ranges of the Jersey Devil, Bigfoot, Mothman, Chupacabra, Shunka Warakin, Caddy, the Honey Island Swamp Monster, and lots of others. I Raff I Ruse – I’m not entirely sure how to describe this one-panel comic, but it’s sort of like if Lovecraft wrote comedy. The Bat-Poet – Sweet little book about a poetic bat, illustrated by Maurice Sendak. The Vampire Rabbit of Newcastle – This may be my favorite grotesque ever. Yes, even better than the Darth Vader one. Saturday Morning Breakfast Cereal – Heh. I’ve had this parked in my Drafts folder since…lessee…October 2012. Huh. It was originally written for an “Urban Legends” guest post-o-rama at Shellhawk’s Nest, but I’d like it to have a home here too. This is, to my eternal shame, a real urban legend local to me. Sigh. Some places get vanishing hitchhikers. Some get ghosts that warn trains of an impending crash. The terrifying local legend where I live? A guy in a bunny suit. Bunny Man Bridge is a small railroad overpass near Clifton, VA. It is supposed to be stalked by a man wearing a bunny suit. Yes, he’s usually said to be carrying an axe or similar weapon, and yes, the legends say that he attacks and mutilates anyone foolish enough to be near the bridge after dark, but I really can’t get past the outfit. Being murdered by someone dressed like a giant rabbit isn’t terrifying, it’s embarrassing. The bunny in question is variously reported to be an escaped convict, a refugee from a nearby (non-existent) insane asylum, or a local lunatic who graduated from mutilating wildlife to murdering children. Since “rabbit” and “insane murderer” don’t seem to have any obvious link, the lapin connection is usually explained by tacked-on details such as numerous remains of snacked-upon rabbits being found in the area (or, in the case of the asylum escapee, that he was originally committed for murdering his family on–dun dun dun!! !–Easter Sunday). Nobody explains where he got the suit. A local historian has identified the probable origin of the legend: In 1970 there were two incidents involving a man–dressed, yes, in a bunny costume–who threatened people with a hatchet whilst yelling at them for trespassing. Over the past 40 years, generations of teenagers have expanded and distorted and added details until what was probably a Furry annoyed at having his private sexytimes interrupted is now a horrible spectral murderer who…is still wearing a bunny suit. Dammit, I really can’t get past the bunny suit. Particularly annoying is that this legend has gained enormous traction throughout the Washington DC area. Civil War battles were fought all over this region. We could have legends about ghostly armies locked in eternal combat, or bloody Confederate soldiers who attack campers, or phantom funeral trains carrying rows of soldiers’ coffins. What are we actually known for? A big cranky rabbit. Wanna see a trick? Click your mouse on that heart up above, keep holding the button, and drag. Presto!  A ghostly axe-wielding bride who takes the “’til death do us part” thing seriously. This type of draggable image takes advantage of HTML5’s native drag-and-drop capabilities, which create a semi-transparent copy of an element when you grab it and drag it around. The images are particularly popular on Tumblr, where they’re used to display hidden messages or other now-you-see-it-now-you-don’t effects. The ghost above was created by octibbles; there’s another cute example here, made by a blogger who seems to specialize in these effects. There are lots of tutorials for creating this kind of image; WikiHow and musings & sketchy lines have easy ones, but a quick search will turn up plenty more. For more advanced effects, check out this neat custom ghost image tutorial. It’s a neat Easter-eggy thing to add to a site which doesn’t take a lot of time or effort. Fun! Vincent Price was kind of awesome, you guys. In addition to being THE campy horror-movie guy, he was a world traveler, art collector, author, and noted gourmet chef (his specialty was Chinese). In 1965 he and his wife Mary published a volume of recipes collected from their favorite restaurants, titled A Treasury of Great Recipes. The original book is expensive on Amazon, but fairly reasonable at sites like ABE Books. However, 2015 is the 50th anniversary of the book’s publication, and a new edition is scheduled for release this fall. There’s a website, Cooking with Vincent, where you can reserve a copy and read a “road trip blog” by their daughter as she visits some of the restaurants from the original book. But wait, there’s more! In 1967, Mary and Vincent published a 5-volume set called Mary and Vincent Price present a National Treasury of Cookery, and in 1969 followed up with Come Into the Kitchen. And then, in 1971, Thames Television gave Price his own cooking show. Cooking Price-Wise with Vincent Price ran for six half-hour episodes, and spawned a cookbook of the same name. The cookbook originally sold for 30p, and the cheapest I can find a copy online is $125US. Price also recorded audio cooking tutorials–his recipe for Viennese Stuffed Eggs can be heard here–and did talk-show appearances like this one with Wolfgang Puck. If you wanted to throw a particularly offbeat goth dinner party, you could play some of Price’s horror movies in the background whilst serving some of his recipes. This went viral a week or so ago but just in case you haven’t seen it, it’s worth a look. Sergei Polunin, who was with Britain’s Royal Ballet until recently, dances to Hozier’s bluesy hit “Take Me to Church” in this impressive video. Little Embroidered Bones – An interview with artist T.C. Hutchinson of tinycup needleworks. I adore all of her little skeletons. The Black Mudpuppy – Webcomic where, to quote its creator, “an Aztec god of the dead is trapped in an axolotl and forced to be a superhero.” We’ve all had days like that. Popular Skullture – A look at the skull motif in pulp magazines, paperbacks, and comic books, back when the image of a skull was still striking and macabre instead of something routinely slapped on baby clothes. Bat Photos – Stunning closeup photos of bats by researcher Merlin D. Tuttle. DIY Skull Bookends – Easy tutorial using a cheap plaster skull. Insect Alphabet – Gorgeous hand-drawn font featuring insects as each letter. Lord of the Rings Dinner Party – This is a great idea, with many geeky details. Carmilla – Artist Isabella Mazzanti did a lovely showcase set of illustrations for the Le Fanu novel. Writer and comedian Dana Schwartz is writing the ultimate dystopian young-adult novel, one tweet at a time. This class system seems really stratified. But I guess if it's the way it's always been, it must be for the best. I saw my friend Jessum through the crowd outside the Testing Center, her coffee/chocolate/hazelnut/cocoa/caramel skin glistening in the sun. I'm so clumsy. I accidentally spilled the Nutrition we had for dinner all over my grey tunic. It just seems like I don't fit into our Society's prescribed categories. "Anthem!" I cried out, "Your rebellious sacrifice isn't worth it!" Anthem looked back at me. "You're worth everything to me, Val." Things like trains, overly simplified first-person narration, and love triangles. I started another parody Twitter account a few months ago @GuyInYourMFA, and I realized how fun it was to skewer overused literary cliches. So, two nights ago, I decided to do the same thing for YA writing, not really intending it to be a full or cohesive story, more just a collection of random sentences and elements. But as I wrote and saw the response, I realized it would definitely be more interesting to try to add plot and tell something from start to finish. The feed is @DystopianYA; her main Twitter account is @DanaSchwartzzz. I can’t wait for this to be made into a blockbuster movie. Giant squid are undeniably awesome, but just as undeniably hard to cuddle due to their unfortunate insistence on living underwater. No more must your squid-snuggling proclivities go unslaked–this Build-a-DIY tutorial has a pattern and easy instructions for making a big plush squid of your very own. Their sample squid is 8 feet long, but the pattern could be scaled down (or, I guess, up if you want a mega-colossal squid). You could make a whole shoal* of different sizes and colors. The tutorial calls for felt, but the construction method seems to indicate that it would work with pretty much any fabric so this would be a good way to use up scraps from other sewing projects. You could have velvet squid, brocade squid, even faux-fur squid if you’re feeling particularly ambitious. The tutorial also suggests polka-dot fabric for the underside of the tentacles to suggest suckers, but also links to a method for creating quilted circles for a more three-dimensional appearance. You could also do both, quilting the polka dots on the fabric for a really sucker-y look. This is a fun project which doesn’t require advanced sewing skills, and the payoff is a cuddly squid of your very own. What could be better? *I couldn’t remember if a group of squid was called a “school” or not, so I startled typing, “a group of squid” and Google auto-suggested “a group of squid is not called a squad,” which makes me sad. I want to be able to yell, “Look! A squad of squid!” and I’m terribly disappointed that I can’t. If you bought any craft pumpkins on clearance after Halloween last year, here’s the perfect project. If you didn’t, well…that was silly of you. Keep this in mind for next Halloween. The Merrythought did a neat tutorial for Design*Sponge for carving constellations in Jack-o’-Lanterns. I love how restrained and elegant they look. Their method uses real pumpkins, but there’s no reason why you couldn’t do the same thing with craft foam pumpkins like Funkins. As they suggest, you could do one or more small pumpkins with one constellation each, or carve several constellations into a larger pumpkin. They suggest spray-painting the pumpkins black, and that’s certainly the most dramatic presentation (it has the added benefit of making the “stars” look like they’re hanging in midair when the lights are out); you could also paint them white and use purple or blue lights for better contrast. Drilling holes and etching straight lines is refreshingly easy, so even those of us without any pumpkin-carving mojo should be able to play along. It’d be fun to do the zodiac constellations of family members, or a set of them associated with a particular myth (such as Orion and his dogs, Canis Major and Canis Minor). Richard Grayson is a composer and pianist who is known for improvising classical music. In a concert in 2009 he received a request from the audience to do Darth Vader’s theme in the style of Beethoven.